Andrew Wilsea was knocked down and killed while riding along Gelderd Road. A dad drove like an “idiot” with his daughter on the back seat of his car moments before he lost control of the vehicle and killed a cyclist, a jury heard. A court heard Andrew Wilsea died after being knocked down as Robert Hall struck a kerb at around 70mph and careered across the road. Hall’s Rover then landed in a hedge and Mr Wilsea’s bike was “embedded” into the side of the vehicle. 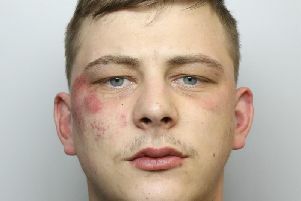 Hall, 31, of Throstle Place, Middleton, is on trial at Leeds Crown Court where he pleads not guilty to causing death by dangerous driving. Hall was taking his daughter to the shops when the collision took place on Gelderd Road, at Gildersome, on August 18 last year at around 6.20pm. The court was shown CCTV footage of Hall’s vehicle going out of control into Mr Wilsea’s path as he cycled in the opposite direction. Camera footage from a bus showed Hall’s car overtaking another vehicle shortly before the collision. Mr Smith said analysis of the footage showed that Hall was driving in excess of 70mph for about a minute as he travelled towards the scene of the collision. The prosecutor said the speed limit for that stretch of the road ranged between 40mph and 50 mph. Mr Smith told the jury that Hall had pleaded guilty to causing death by careless driving but denied the offence of causing death by dangerous driving. Witness Jonathan Braithwaite told the jury how he had seen Hall’s car moments before the incident as he was walking home from work. Mr Braithwaite then described how he came across the collision scene a short time later. He said he went to help Mr Wilsea and tried to give him first aid until paramedics arrived. Mr Braithwaite said he then went to help Hall who was stood with his daughter. Mr Braithwaite added: “He had blood on his face but it didn’t look like he had any injuries. I asked if there was anything I could do. The jury was told Hall was interviewed by police after the incident and told officers he believed he had been travelling between 45mph and 50mph. He claimed he hadn’t been rushing to get to the shops as he had his daughter in the car and lost control when the back end of the vehicle skidded.